← Dese Indians Be Crazy! Black Friday Riots Evidence of Moral Decay? Or Congenital Silliness? The first video was posted about a year ago. It’s based, in part, on the “Black Friday” riots of A.D. 2010 when video cameras caught Americans trampling each other to get at the Christmas “bargains” in several stores. The video shows a class of Americans who appear less than noble. The point to the video is that America has become so materialistic, that it’s losing its dignity. How are we going to save this country insofar as Washington DC is populated by a bunch of treasonous whores, and more than a few Americans are too ignorant and greedy to even want to be saved? I’d say this video is “darker” than it needs to be, but it makes a point: Welcome to the mobocracy. Our government claims the people are “animals”. I claim we’re not. (See, “Man or Other Animals“.) This video tends to support the government’s claim rather than my own. 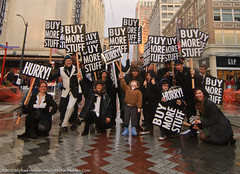 On the other hand, here’s an A.D. 2011 Black Friday feeding frenzy over sale-priced waffle makers. I’m amused by the number of fat people scuffling to get hold of a waffle maker (that will help make them even fatter). Unlike the previous video, this one is kinda funny. The people aren’t pathetic so much as ridiculous. Our tendency to “stampede” is not necessarily evidence of moral decay so much as a kind of silliness. America is not yet lost. I recall that it was not merely the occupying Roman forces and Governor or the Jewish religious authorities alone who had Christ crucified…the people we asked to choose who they would rather set free for Passover’s sake…and the people chose Barrabas.